The Mann family is going through a difficult time: Sunny is hugely pregnant with their second child; their autistic first child Bubber is increasingly having trouble at preschool; Sunny’s mother is in the hospital slowly dying; and Maxon is heading to the moon to set up robots for a future moon colony. Everything is already chaos when Sunny and Bubber are in a car accident that knocks Sunny’s wig off of her head and into the street. Bald since birth, Sunny has been wearing a wig ever since she and Maxon moved to Norfolk, Virginia while she was pregnant with Bubber as part of her attempt to be the perfect wife and mother. Now that her cover has been blown in front of her neighbors, Sunny must once again discover and decide exactly who she is. There was only one thing that I didn’t love about Shine Shine Shine, and that is the fact that with every sentence I realized that I would never be able to write like Netzer does. Nearly every sentence surprised me with plot, turn of phrase, or characterization. Shine Shine Shine is definitely quirky – after all, the main character is a bald Caucasian woman born in Burma during an eclipse – but it manages to be so while still maintaining a real and realistic quality. Most of us may never have any of Sunny’s particular problems, but the way she questions her identity is universal. Shine Shine Shine is wonderful and difficult to put down. It is a wonderful book and one I highly recommend. 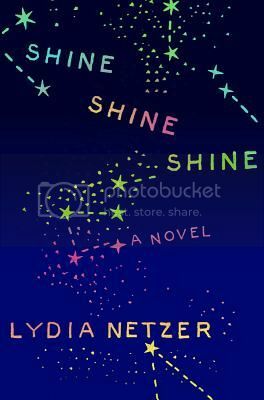 For more about Shine Shine Shine, please see my review and my interview with Lydia Netzer for SheKnows.com. What a very quirky read! The style sorta reminds me of Tom Robbins. I’ll have to look for this soon. The characters seem to leap from the page right in your review — so I’m definitely interested in this one! I’ve been reading a lot of futuristic/dystopian sort of reads lately, though this sounds more like a tale of family dynamics than anything happening on the moon. Yeah, there’s a slight futuristic/scientific element from Maxon’s storyline, but it is pretty firmly rooted in contemporary family dynamics. I just received the an audio copy. I hope it’s as good as the book. Joshilyn Jackson should do a great job with it! Totally agree with your take! I loved this one! I’m so glad I saw this review, because this one wasn’t even on my radar and it sounds lovely! This book sounds wonderful, different and unique. I will add to my TBR list.